Berytech invites you to join a community and network of entrepreneurs in Lebanon focusing on science and technology. 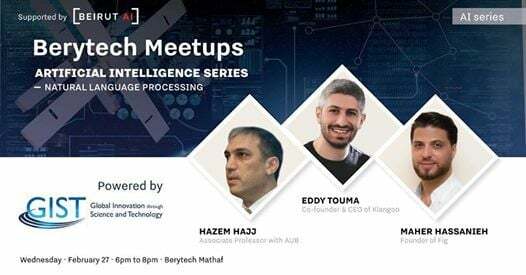 This first edition for 2019 is focused on Natural Language Processing and is organized in collaboration with Beirut AI. The talks will be followed by a networking session with the speakers. 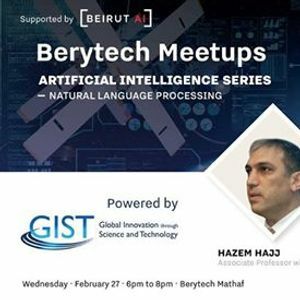 Hazem Hajj – Associate Professor at American University of Beirut (AUB), discussing Artificial Intelligence and Natural Language Processing techniques, the latest technologies and its applications, and the challenges we are facing including the lack of research for NLP Arabic. Hazem is a senior member of IEEE. Over the years, he established leadership in the field of artificial intelligence building on a strong mix of industry and academics experiences at Intel Corporation and AUB. His research has produced over 100 publications in the A.I. field in addition to multiple patents and awards. Eddy Touma – co-founder and CEO of Klangoo, talking about Beyond Machine Learning, rule-based NLP. He will also talk about the usage of NLP in his startup. Eddy holds an M.S. in Software Engineering and has been a researcher in the A.I. domain for more than 12 years. He developed patented solutions in A.I. and worked previously in both technical positions and marketing/corporate communications roles in Lebanon, Qatar, and USA. He won several awards including the Microsoft Imagine Cup EMEA in 2006. Eddy also advises startups on funding, product roadmap, and monetization strategies. Maher Hassanieah – the founder of Fig, talking about Conversational AI, its drivers, history, current applications and the offerings of FIG. Prior to Fig, Maher had accumulated over 14 years of experience in the domains of Big Data, IT and Education. A Graduate of the American University of Beirut with a degree in Computer Science, his experience ranges from pure technical roles to sales, management and consultancy. Make sure you register; Seats are limited.